Easy and Delicious Granola and Two Product Reviews! This granola is some of the best I have ever made...and I've already made this three times since discovering the recipe HERE last week. Amy has a nice blog where she focuses on unprocessed foods and this recipe is a hit! I love it because it is totally customizable. You can use whatever mix of seeds/nuts you like. You can even mix up the sweetener and fat binders. On this batch I used coconut oil and honey. I also made a batch with maple syrup and coconut oil and a batch with honey and peanut butter. They all came out wonderful! 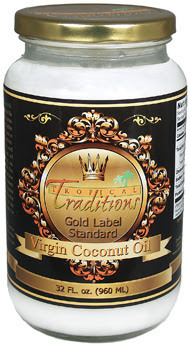 I was really excited to try this recipe with Tropical Traditions Gold Label Virgin Coconut Oil. (Disclaimer: Tropical Traditions provided me with a free sample of this product to review, and I was under no obligation to review it if I so chose. Nor was I under any obligation to write a positive review in return for the free product.) I have used other brands of coconut oil (in my BEST Chocolate Chip Cookies), but I have to say, I like this one the best. If you'd like to learn more about this coconut oil you can go HERE. The original recipe for this granola called for butter, so I simply replaced the butter with coconut oil, and used a bit less than the the amount called for. The results were outstanding!! 1. Preheat oven to 250 degrees F. Line a large ( I used a 1/2 sheet size ) baking sheet with parchment or use a silpat. ( I used a silpat ) You might want to use two baking sheets, and split the granola between them to, but I found using one was just fine, as long as I stirred the granola while it was baking. I really hate to wash dishes! 2. In a large bowl, combine all ingredients except honey, coconut oil, and vanilla. Stir to mix well. 3. In a large glass measuring cup, pour in 1/2 cup honey. Add in the coconut oil. ( depending on the temperature it is stored at it will either be liquid or solid) Heat the mixture in the microwave for 1 - 2 minutes on high, or just enough to melt the coconut oil. Stir the two together. Add the vanilla extract. 4. Pour the liquid honey mixture over the oat mixture and mix well. Spread the granola onto the prepared baking sheet ( or sheets, you can split it onto two sheets, but I found using one was just fine as long as I periodically stirred the granola while it was baking) Bake for 65 -70 minutes until the granola is smelling great and looks a bit toasted. It will still be "wet" when you remove it from the oven, but will crisp up quickly as it cools. Store in airtight container. I love, love, love this granola recipe. It is basically a dump and bake deal, making it super easy. Peanut Butter Granola - sub the coconut oil for natural peanut butter and the pecans for raw peanuts. Speaking of DE-licious.....have you seen these products at your grocers yet? O. M. G. What a delicious treat! With all three products, the pumpkin flavor was just right, not overpowering with little bursts of sweet pumpkin flavor. The English muffins are 4p+ each, the Bagels are 7p+ each, and the Bagel Thins are 3p+. All three products are low in fat. These products really speak "fall" to me. They are a nice change to mix up your breakfast or lunch. 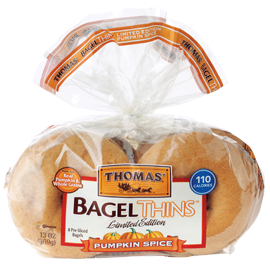 The Pumpkin Spice Bagel Thins make a great sandwich with some smoked turkey! And for breakfast, I really enjoyed the Pumpkin Spice English Muffin with a bit of butter. Low enough in points+ I could enjoy one beside my eggbeater omelet for a very respectable point plus breakfast. Look for these in a grocer near you! Remember, they will only be available for a limited time, (from mid-September to early December) so grab them while you can. They are worth it! That granola recipe looks amazing! I love that it uses coconut oil. I'll have to give it a try. I've been meaning to make some granola for the house because it seems like something my boyfriend could bring to work to snack on and I could sprinkle in my yogurt parfait. This looks delicious! I have a hard time limiting myself when granola tastes so darn good. I am always on the look out for a granola recipe - my boss eats it just about every day and I try to keep her stocked up - thanks for the recipe Renee! Pumpkin spiced bages???? Be still my heart!!!! Have a great weekend Renee. Thanks for the granola recipe and review Renee. I love home made granola on my yogurt. I have had those pumpkin bagel thins, just bought a pkg this week. They are really pretty good for something of a change in the ole food plan. Coconut oil is so healthy, I have been using it quite a bit. Haven't tried that brand but I will look for it.